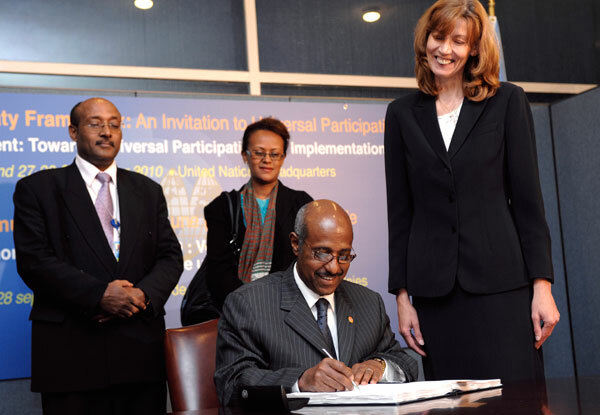 On May 22, 2015, the Ethiopian delegation presented before the expert rapporteur members of the Committee on the Rights of the Child to discuss how they are promoting and protecting the rights of Ethiopian children within the borders and abroad, as well as other children living within Ethiopian borders. IIMA and VIDES were present as well. They spoke of the improvements since the last Convention, including the integration of child rights into every ministry of government. The annual budget for the Ministry of Women, Children, and Youth Affairs has also risen by 300% in the past three years, which has directly led to an increase in girls’ school attendance nationwide, from 34.6% to 47%. Overall, there was a dramatic increase in all children’s school attendance from 3.7 million to 18 million. It was also noted that separate sanitation facilities for boys and girls are now required in schools, and that there is much more collaboration in parent-teacher-student associations. Other concerns brought forth by the Committee to address education rights were the high rate of dropouts, especially those related to teen pregnancies; the lack of support and inclusion for children with disabilities; de facto discrimination in relation to urban v rural schools, and indirect school fees; the lack of full reintegration into schools for children following detention; lack of prevention mechanisms to keep children from having to live in the streets; lack of instruction in minority languages; the lack of the presence of early childhood education for children under 5 years old; and the need to address the right to play.